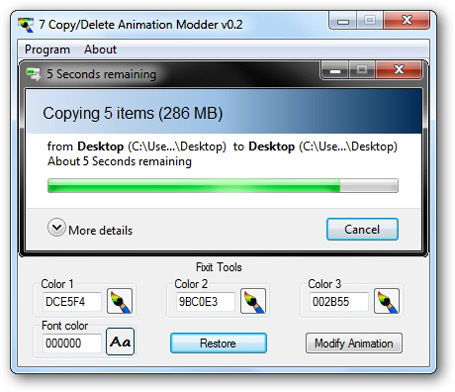 Copy Delete Animation Modder is a free portable tool that allows you to change the copying, moving, deleting & applying attributes animation colors in Windows 7/Vista. Click the icon near Color 1 and select the color of the left side of the gradient. Click the icon near Color 2 and select the color of the middle part of the gradient. Click the icon near Color 3 and select the color of the right side of the gradient. Click the icon near Font color and select the color of the text. Click Yes if you want to restart your PC.